Grumichama, also called Brazil cherry and Spanish cherry, is an attractive tree growing up to 45 feet in height with thick waxy oblong deep green 3 to 4 inch leaves. The tree can be pruned as a shrub and kept at 6-foot heights to facilitate harvesting. In Hawaii it produces fruit from 300 foot to 2000-foot elevation. 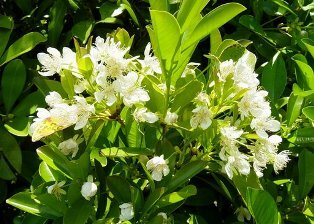 Mature flowering trees are reminiscent of Japanese cherry trees producing thousands of 4 petal white flowers each with about 100 white stamens and yellow anthers. The long stemmed fruit is 1/2 to 1 inch diameter turning from green to red to dark purple and black as it ripens. One variety produces a yellow colored fruit. The fruits thin fragile skin with sepals below holds juicy white to red pulp and 1 to 3 small gray seeds. The flavor is like a sweet subacid cherry with a hint of jaboticaba and is aromatic. 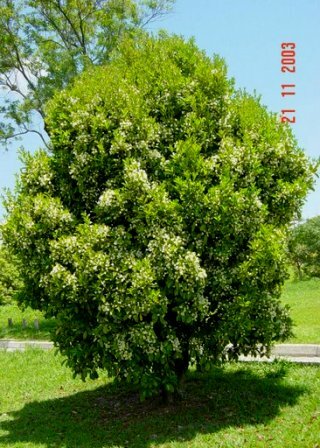 A member of the Myrtaceae family, the plant is related to guava, jaboticaba, mountain apple and other Eugenia, which includes’ more than 30 edible species. The tree was first reported in Hawaii in 1821 in Don Francisco de Paula Marin’s journal. Grumichama may have arrived as early as 1791. There are no reported cultivars but there are a number of differences in seedling trees observed in Kona and Puerto Rico. Three varieties have been distinguished based on differences in the firmness of the pulp as well as the number of sepals and color of the fruit and pulp. There are no discernible differences in taste. The grumichama is a subtropical that prefers partial shade but will produce fruit in full sun. Fruit production is best when annual rainfall is above 70 inches ; supplemental irrigation can be used where rainfall is lower. The tree prefers deep sandy loam but will survive shallow sandy soils given enough moisture. Fruit production generally begins in the 4th year from seedling trees that are about 4 foot tall. The trees will grow about 1 foot per year but can be kept pruned as a hedge while still producing abundant fruit. Given enough moisture, trees at elevations from 250 to 900 feet tend to produce more fruit than those at higher elevations although leaf growth appears to be about the same. Seasonal changes and Hawaii’s microclimates have little effect on the tree as long as it has sufficient moisture. Numerous seedlings are often found under abandoned trees. The tree is well known for the speed at which the flowers develop into fruit. Depending on the elevation and rainfall, flowering occurs in May to July with fruit being ready to harvest from 3 to 4 weeks after flowering. Although there is some commercial cultivation in Brazil, grumichama is still regarded more as a backyard tree when left to grow tall. Cultivated trees can be maintained at heights of 10 feet or less to facilitate harvesting. Trees are planted in 15 to 20 foot spacing or kept as hedgerows, which, although attractive, tend to produce less fruit than trees spaced at 15 feet. Quarterly fertilizing with .25 pound of organic 6-6-6 until the third year of growth, followed by .25 pound of 8-8-8 is recommended with the amount of fertilizer increased, commensurate with growth. Fertilizer should be applied around the drip line. Twice-yearly applications of peat moss or mulch will help growth. Micronutrients should be applied as needed. Care should be taken not to over fertilize which impedes flower development. The tree is tolerant of a wide range of soils that are well -drained. Sufficient water, especially during flowering and fruit development is essential. One-year old trees at 350-foot elevation, in a dry location, receiving 10 minutes of daily irrigation with a 1/2 gal per hour emitter, showed more growth than trees without irrigation. As with most Eugenia species, grumichama requires a little pruning for keeping the desired height or shaping and removing dead wood. Weed control is crucial during the first few years of growth. Mulching with organic materials or using black polyethylene sheets dramatically reduces weed growth. Young shallow rooted trees require protection from strong winds. There are no serious disease problems with grumichama when proper cultural practices are employed. It is considered a host for fruit flies. Birds remain the largest problem for growers of the fruit. Some Brazilian growers use netting to keep birds from the tree. Mylar tape, Christmas tinsel and CD ROMs hung from the tree can help to keep bird damage to a minimum. For many culinary applications where the fruit will be processed or cooked, the fruit can be harvested when red, before the birds are attracted to the sugars that develop in the dark purple fully ripe fruit. Generally grown from seed, trees can be grafted or cloned by air-layer and cuttings. Seeds remain viable for up to 6 weeks. The thin-skinned grumichama fruit is delicate and care needs to be taken when harvesting and packaging fresh fruit for commercial sales. Placement of fruit in 1pint containers in no more than a double layer prevents damage and maintains attractiveness. Keeping the stem on the fruit is difficult but also helps to prevent desiccation. Fruit is marketable for 10 to 12 days. Mature 10-foot tall trees can yield more than 50 pounds of useable fruit. Approximately 6 pounds of fruit can be processed into 8 cups of puree. Mature trees kept pruned at 6 feet should yield just under30 pounds of fruit. Fruit should be refrigerated as soon as possible after harvest. Samples harvested, packaged and chilled within 1 hour, maintained appearance and quality for 12 days. Samples left in open air for 5 hours before refrigeration (36o F) maintained quality for only 5 days. Fruit should be utilized as soon as possible after harvest. Processed puree can be frozen for future use although some loss of flavor has been reported. The project grumichama tree produced an annual marketable yield of 61.8 pounds. The average market price was $7.00 per pound, and therefore the tree generated a gross revenue of $432.25 for the year. Growing costs (fertilization, irrigation, pruning and all weed and pest control) amounted to $17.13, and harvesting costs (picking, packing and delivery to market) totaled $107.60. (All labor to grow and harvest the gumichamas was assumed to be paid at an hourly wage rate of $16.00, including withholding, FICA and benefits.) Thus, the total annual operating costs, sometimes referred to as “variable costs,” were $124.73. The gross margin (gross revenue minus all operating costs) was $307.52. The grumichama gross margin is the amount of money available to pay all the ownership costs associated with the grumichama enterprise. Ownership costs, sometimes referred to as “fixed costs,” include the value of land used (rent or rent equivalent or mortgage and property taxes), the value of the capital investment (such as the tree establishment cost and buildings and vehicles), the value of the management, and the value of any unpaid labor. (All paid labor is already included in the gross margin.) Ownership costs, unlike operating costs, will vary substantially from farm to farm and will depend largely on how the farming operation is financed and on economies of scale. Each grower will have to calculate his total farm ownership costs and then allocate an appropriate portion of these costs to each enterprise on the farm. Now the profitability of the grumichama enterprise can be determined by subtracting the grumichama enterprise’s share of the total ownership costs from the gross margin for grumichama. For grocery and restaurant distribution, plastic containers with single and double layers of fruit were tested with no discernable differences. Given the sensitivity of the fruit and skin, larger packages are not recommended, as the weight from multiple layers of fruit will damage the skin and cause indentations that make the fruit less desirable when used for edible displays. 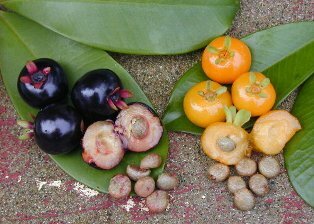 As many chefs and produce buyers in Hawaii are not familiar with grumichama, it is advisable to offer samples as well as information on the fruit. Fruit availability is generally only 2 weeks within the year and advance notice given to buyers will help in generating sales. Having a good working relationship with chefs and wholesale buyers will insure that the fruit does not go to waste. Culled and excess fruit can be processed in a certified kitchen for future use. Many island chefs prefer to work with frozen puree. Fresh fruit in plastic blister packs were sold based on $7. a pound to hotel and restaurant chefs. Wholesale buyers and grocery store buyers paid $4.50 to $5.50 a pound. Processed puree in 8-cup packages are sold for $50.00 An 8-cup package can yield approximately 24-4oz. jars of jelly with a wholesale value of $102.00. *Food values are averages from tests performed at a number of locations by different institutions. Whole pitted fruit can be used in pies, cakes and fruit salads. Processed puree in jam and jelly or in sauces. Island chefs have described the flavor as being like a light Concord grape mixed with cherry and jaboticaba. The pulp is juicy with a dry “grape like” skin.